Michael "The Grinder" Mizrachi is a member of the 2010 "November Nine" and will have 14,450,000 in chips when the final table gets under way in November. 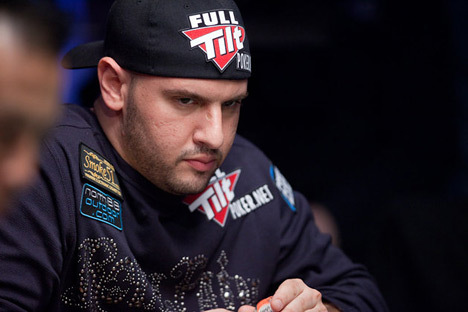 Of the nine players who still remain in the 2010 World Series of Poker main event, Michael "The Grinder" Mizrachi is by far the most recognizable name. As it stands right now, "The Grinder" has over $9.6 million in total lifetime tournament cashes when you include the $800k+ that he is now guaranteed to make from his deep run in this year's main event. This puts "The Grinder" 14th on the all-time money list. If Mizrachi either wins the main event or finishes as the runner-up, then he will vault ahead of everybody else on the all-time money list (including Phil Ivey) to take over the #1 spot. "The Grinder" also has countless victories in preliminary and weekly tournaments under his belt as well. Mizrachi's run at the 2010 World Series of Poker came after some news about his current financial situation was published in a newspaper. According to the Miami Herald, Mizrachi owed $339,000 in federal taxes and had two Florida properties (house in Miramar and condo in Hollywood) foreclosed on. According to the Herald, the federal tax lien was for his 2005-2007 earnings. Mizrachi's resurgence began at the $50k Poker Player's Championship at this year's World Series of Poker. According to various reports, Patrik Antonius backed "The Grinder" in the tournament (as well as his brother Robert), and ended up seeing both of his horses make the final table. "The Grinder" ended up taking down the tournament for $1,559,046. After Patrik Antonius took his cut, Mizrachi was still left with a sizable chunk of change that would help to rebuild his finances. "The Grinder" didn't stop there though, as he managed to make a total of FOUR final tables at the 2010 World Series of Poker. In addition to making the final table of the $50k Poker Player's Championship and main event, Mizrachi also managed to go very deep in the $10k Limit Hold'em Championship and $10k Seven Card Stud Championship, finishing 8th and 6th respectively in those events. Now, as part of the 2010 "November Nine", Mizrachi has a chance to take down the first place prize of nearly $9 million. If he manages to accomplish this feat, then "The Grinder" would have over $17 million in total lifetime tournament cashes (Phil Ivey is currently #1 on the all-time money list with $13.5 million in total cashes). Many people were very happy when Mizrachi managed to put together his magical run at this year's World Series of Poker. Why? Mizrachi is a well-liked player that has the respect of most of his peers on the circuit. Mizrachi is a family man who is happily married (to his wife Aidiliy) with three kids. Mizrachi's family is never far away from him, regardless of which city he is currently playing in. After initially hitting it big a few years ago, "The Grinder" bought a motor home so that he could travel with his family while playing on the circuit. Eventually Mizrachi and his family decided to sell the motor home and purchase a home. You would think, given his success as a live tournament player, that Mizrachi would be in line to receive a fairly lucrative sponsorship deal from either Full Tilt Poker or Pokerstars. Mizrachi formerly had a deal with Absolute Poker, but the deal was dissolved after Absolute Poker decided to dump a number of their pros following the inclusion of the UIGEA into the SAFE Port Act. 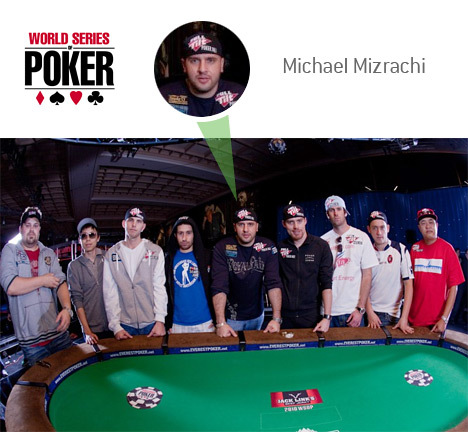 Congratulations to Michael "The Grinder" Mizrachi on his remarkable run at the 2010 World Series of Poker.